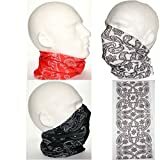 Set of 3 assorted biker neck tube scarves. Each with a paisley pattern. Made from stretchy synthetic fabric it’s breathable so will keep you warm in winter and cool in summer. Brief wearing ideas are illustated on the package it comes packed in. Great for keeping your mouth covered when bike riding, running or jogging. Can keep your hair out of your face while doing sports etc.